Kitchenaid Grain Mill Attachment = AWESOME!!! Last week I broke down and bought a KITCHENAID GRAIN MILL ATTACHMENT WOOOOOOOOO!!!! Okay, there are probably a few of you out there who don’t quite get the all-caps-league excitement. I’ll admit I pretty much nerded out on this one. But I’ve been thinking about this one for awhile now, and I believe it was a good move to bring more nutrition to our baked goods. – Whole wheat flour is not really “whole”. It has part of the germ removed because the germ, which contains oils, can go rancid quite quickly. So they remove this to make it more shelf stable. – The germ contains most of the nutrition, including B vitamins, vitamin E, calcium, zinc, copper, manganese and potassium. It also contains enzymes that help your body in numerous ways. None of this makes its way into store-bought flour. 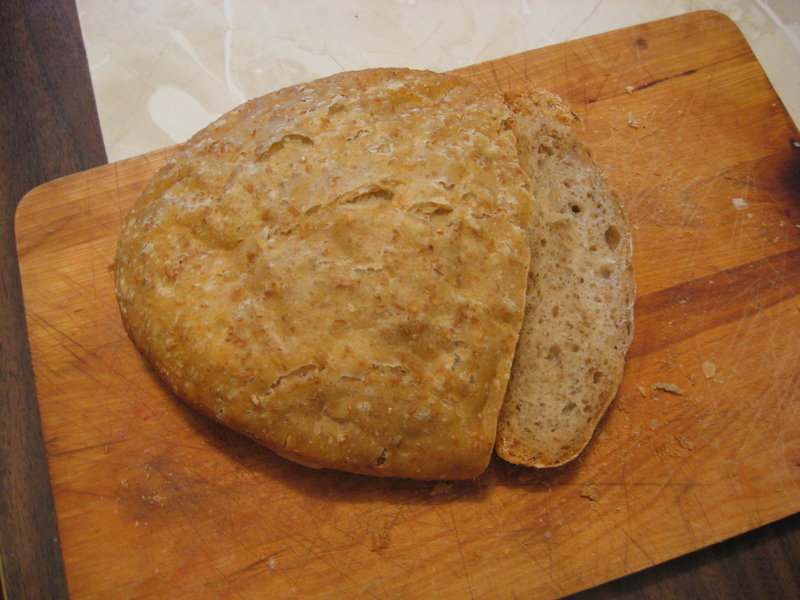 – Store-bought whole wheat only has a fraction of the fiber that whole grain fresh flour has. – Wheat berries are incredibly shelf stable, lasting years–possibly even decades! I recently threw out most of a 10 kilo bag of (poor quality) whole wheat flour because it went rancid. For me, moving to grinding my own flour will mean producing less waste as well as better nutrition. It will also be cheaper than buying organic flour from the store. And it makes AMAZING pancakes! The only glitch in my plan is that I’ve found fresh flour acts quite differently in bread making than store-bought flour. 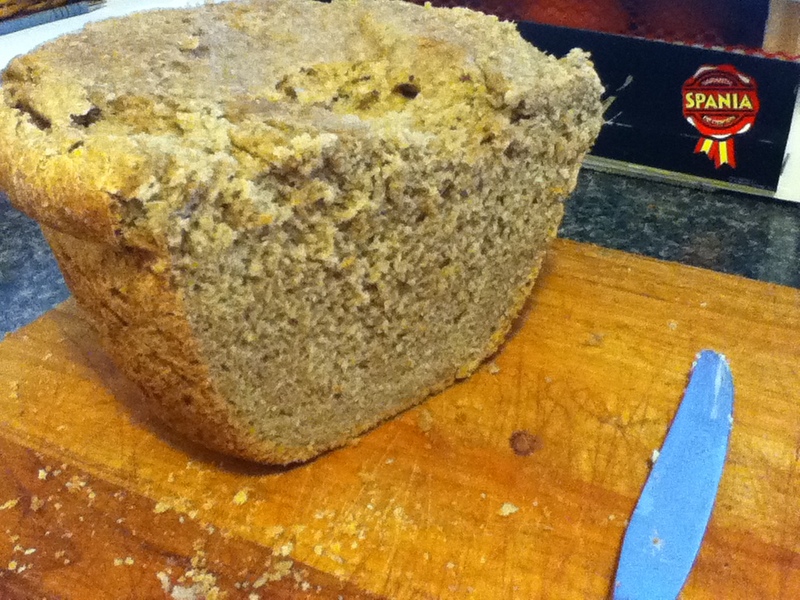 This might be because the increased bran cuts more of the gluten strands, making it harder to get a light, airy loaf. It could be because the grind is not as fine as store-bought flour. Or, it could be that some oxidization actually helps the flour produce a better loaf, as posited by some users on The Fresh Loaf. I read a lot of grain mill reviews before buying the Kitchenaid attachment. This one has many negative reviews due to people burning out the motors on their mixers. But knowing this gives me power–instead of going ahead and milling 10 cups on the finest setting at the highest speed, I’m choosing to mill smaller amounts at a time, doing two (or three) passes, moving from coarse to fine, at slower speeds. I was thrilled that my machine, a 325 Watt Artisan, didn’t even break a sweat. The other benefit of the Kitchenaid Grain Mill is that it can mill very coarsely, which will be great for cracking grains for porridge or for multigrain mixes for bread. I’ve heard fresh-cracked corn grits are amazing! I’ve now got some new challenges, and new projects ahead of me. I’m EXCITED!!! Okay, this was not done in the bread machine, but it was a loaf I baked on my holidays in my new cloche I got for four dollars. In the middle of the first week of our holidays I took a trip to Value Village in my hometown. I was on a quest: for a bread maker. 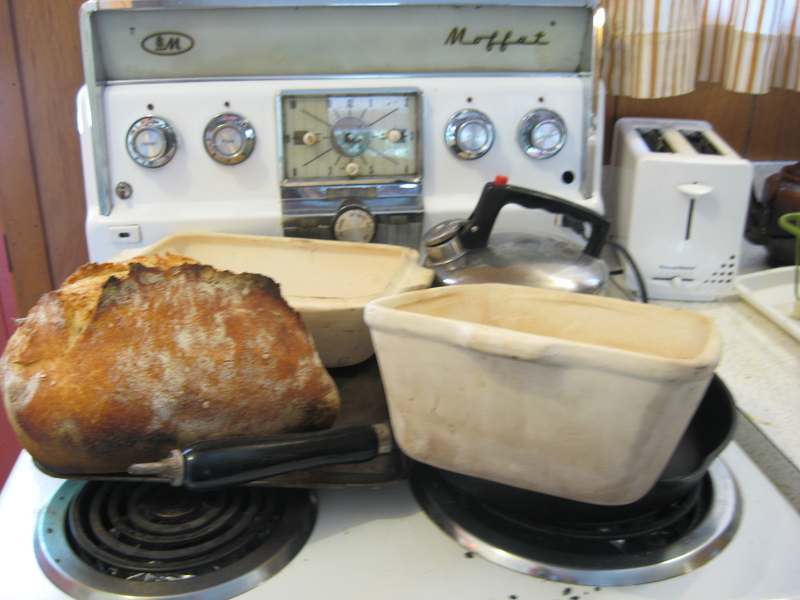 I had seen bread makers at just about every garage sale and I just KNEW I could pick one up at the second hand store. I picked up a West Bend model with the words “The Natural Choice” written in reassuring letters on the top. It was $17.99. Thus began the theme of my holidays: baking bread. Of course I had to try it out right away, so I took it home to my sister’s house and quickly found a recipe online for whole wheat bread. I scanned her cupboards, found all the ingredients, threw them in to the machine, and waited . . .
“It’s not doing anything,” I told my partner after 15 minutes. “It’s not doing anything,” I told him again after 20 minutes. Which was when I took to the internet and found out that most bread machines have what is called a “rest period” where they let the ingredients come to room temperature before mixing. Aaah–it’s not broken. 20 minutes later, it sprang to life, mixing with vigour. Over the next 4 hours, it kneaded, rose, punched down, rose again, and baked, producing a lovely fragrant loaf of whole wheat bread. And all I had to do was measure the ingredients! Now, let me just say, to maintain my bread cred, that I am very anxious to go back to my hand kneading, slow-rising, hearth baking ways–after the heat of summer has passed. 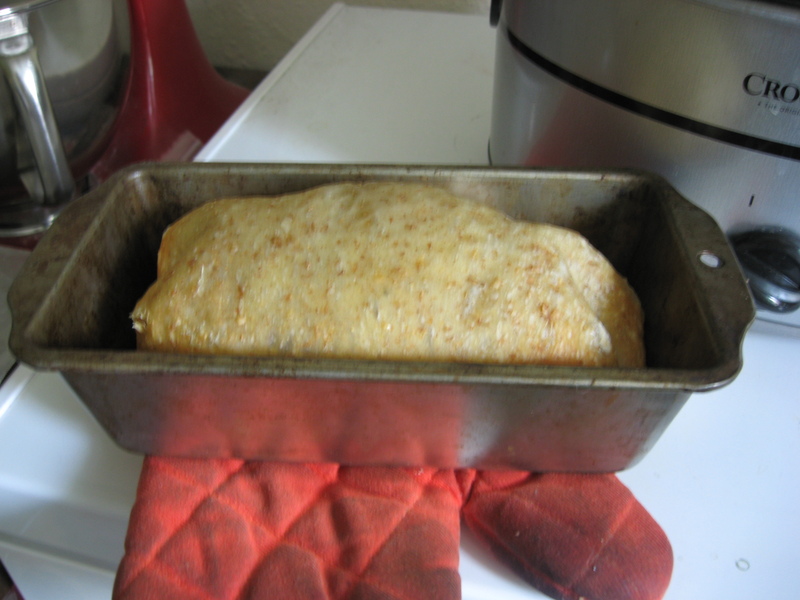 The beauty and magic of the bread maker is that it doesn’t require me to heat up the oven, and hence the house. This means I can bake bread on the hottest day of the summer!! 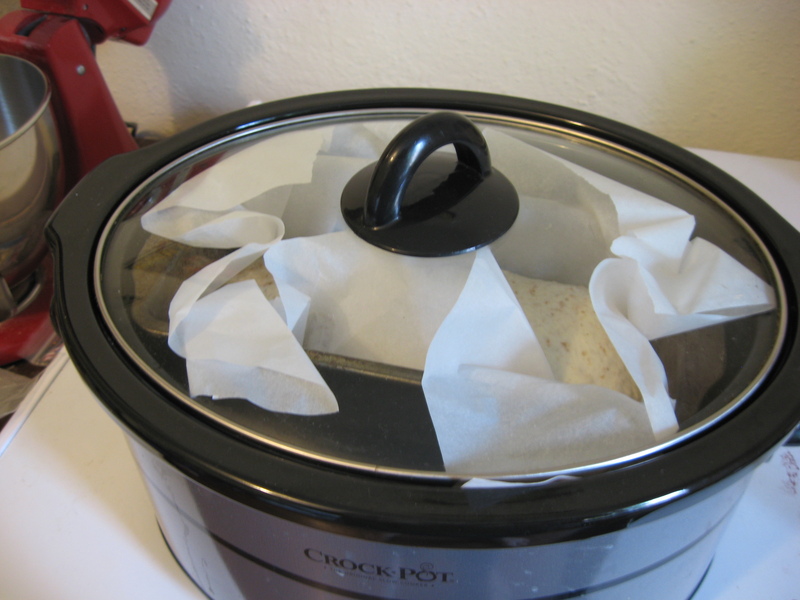 No more fooling around with baking in the slow cooker (that never really worked anyway). 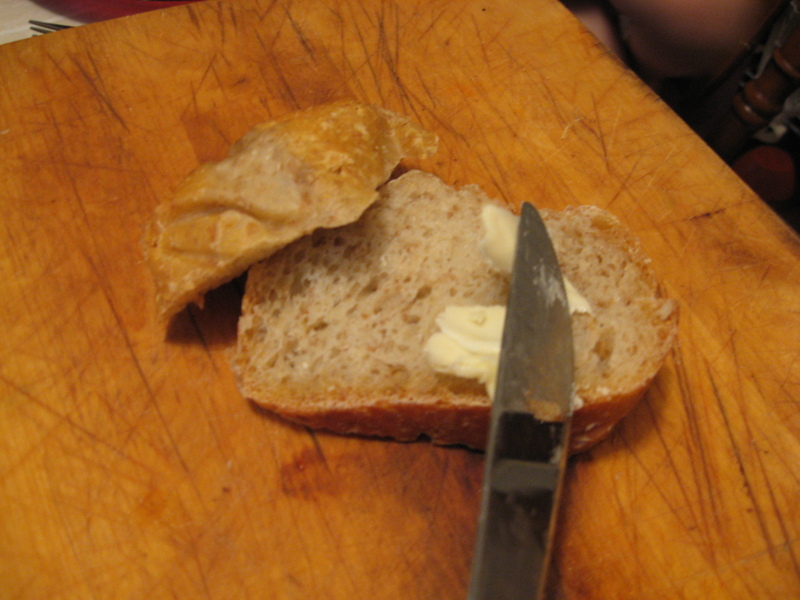 I think I made bread every day after that, both there and at the cottage we stayed in on Manitoulin Island. Lots of sandwiches. Lots of toast. Lots of bread and butter. Has my bread maker earned its keep? Without a doubt. I’ve read it uses about a nickel’s worth of energy to bake a loaf, and it probably takes less than a dollar’s worth of ingredients. Compare that to the $3.50 to $4 we usually spend for a loaf of bread, and you can see the evident savings. The other factor is that when you make a lot of bread, you will eat a lot of bread, which means that you are probably replacing some more expensive foods with cheaper food. Mmm–pass the butter. 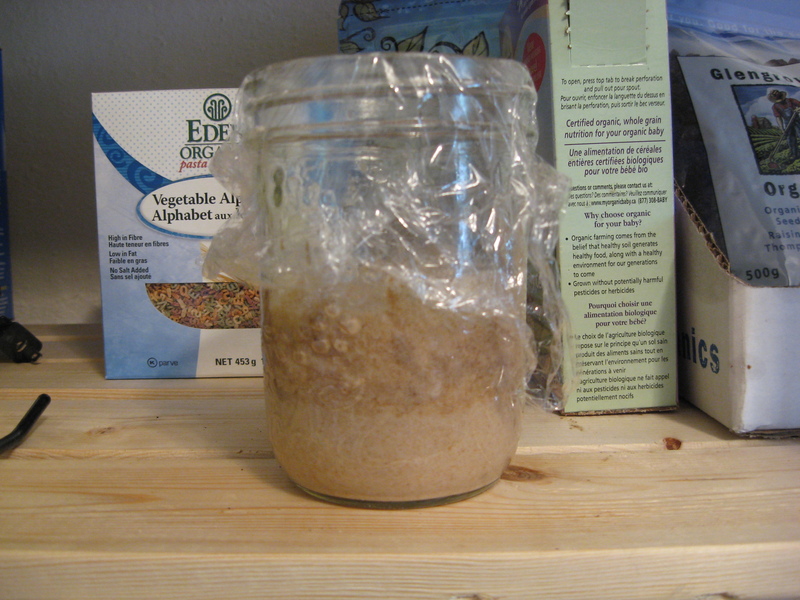 My next challenge will be getting my sourdough starter up and running, and then attempting to make some spiked dough sourdough in the bread machine. How about you–any experience with bread machines? Any great recipes to share? Have you too experienced bread machine bliss? ?